Image: The largest computerized mirrors array in the world, located in the Israeli Weitzman Institute. The array is capable of concentrating the sun energy to the desired location, achieving extremely high temperatures. Breaking the water molecules by simply heating them is not practical, since it requires achieving temperature above 2,500°C (4,530F). Many years ago it was discovered that it is possible to use pure zinc to extract the oxygen from water, therefore releasing hydrogen. This process can be done in the much lower temperature of 350°C (662F). Since zinc is a relatively abundant metal, and is the fourth among all metals in world production – being exceeded only by iron, aluminum and copper – it can be considered a natural choice for producing hydrogen. The problem is that the current industrial production of pure zinc (Zn) from zinc oxide (ZnO) by either electrolysis or smelting furnaces is characterized by its high-energy consumption and concomitant pollution, derived mostly from the combustion of fossil fuels for heat and electricity. To address the issue solar energy can be used as the main energetic source in the production of Zn from ZnO. In 2004 the European Union and the Swiss Federal Office of Science and Education decided to fund a joint research to explore this possibility using a 45 kW solar furnace in Villigen, Switzerland, a 75kW solar simulator in Zurich and the largest solar research facility in the world with 1MW output located at the Weitzman Institute in Israel. The need for such a large amount of power is due to the need for very high temperatures required for the production of Zn from ZnO (normally around 1750°C / 3182F). Adding small amounts of carbon in the form of coal enabled the Weitzman team to reduce the Zn production temperature to a more manageable 1200°C (2192F). For the future, the team sees the possibility of replacing the coal completely with biomass thus making the entire process completely pollution free. The real achievement of the Weitzman team is the scale of production of Zn which reached an average of about 50kg/h during tests using the existing Solzinc solar reactor located at the center of the Institute. On a full scale industrial facility much larger amounts could be extracted using a similar process. The energy cycle developed by the researchers is very efficient and relatively self-sustaining. ZnO is mined and transported to the Solzinc solar facility where it is mixed with small amounts of coal and put inside the solar furnace located on top of a high tower. 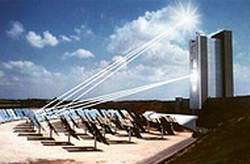 A large array of heliostats (computer guided highly reflective mirrors) follows the sun around the sky and reflects the light to a hyperbolic mirror located inside the solar tower producing highly concentrated heat inside the solar furnace. At a heat of above 1200°C (2192F) the ZnO breaks down into Zn and oxygen which in turn recombines with the carbon to create CO as a minor by-product. The Zn is then cooled down to create a fine powder which can be safely handled and transported. In order to produce hydrogen from the Zn powder a much simpler process is performed where the Zn is mixed with water at a temperature of 350°C (662F). The oxygen inside the water recombines with the Zn to produce ZnO once again and the by-product is pure hydrogen. And now for the 10 million dollar question: if the process is so simple and efficient why can't you buy zinc-based hydrogen fuel at your local fuel station right now? First of all, there is the lack of infrastructure. Currently there are almost no hydrogen fuel stations, let alone hydrogen-based cars. This could change within 5-10 years but it will require great investments by both countries and the industry. It will also require large amounts of inexpensive accessible hydrogen, and here enters the Solzinc process developed at the Weitzman Institute. As Michael Epstein, head of the Solar Research Facilities Unit in the Weitzman Institute explained in an interview to IsraCast, it is now up to the industry to push the project forward into full commercialization. His assessment is that with the backing of the industry, full-scale production of hydrogen from Zn using the industrial Solzinc facility could begin within 8-10 years. In the meantime, Epstein is considering more immediate uses for Zn such as Zinc-Air batteries which are similar to existing batteries but get one of their main reactants-oxygen-from the outside air. These batteries are nontoxic and are neither highly reactive nor flammable. Several companies across the world are currently developing Zinc-Air batteries; among the leading ones is the Israeli company Source: Electric Fuel which develops Zinc-Air battery technology for automobiles.